Discover the Cities of Flanders : Sightseeing Information, Videos and Pictures. DiscoverFlanders.com - An Introduction to Flanders, with pictures and videos. The historical cities and provinces of Flanders as located in the present-day Flemish Region of Belgium. When residing in one of the cities (except Mechelen), you can visit all the other important cities by direct train links. All locations can be reached in 90 minutes or less. So you really do not have to change hotels as you travel around Flanders. Except possibly for Ghent and Antwerp, you can reach the city centers just by walking a bit. You can also elect to save exertion by using the public transport buses of De Lijn from the railway stations. Flanders is the name of the political community of the Flemish (or Flemings), located in the northern part of present-day Belgium (see dark pink area on the map). It consists of five provinces : West Flanders, East Flanders, Antwerp, Flemish Brabant and Limburg. Its capital is Brussels, which is not part of any province. It is of interest that foreigners, especially outside Europe, often think there is such a thing as a 'Belgian' language. Not so, the language spoken by the Flemings is Dutch (or Flemish), while in the southern region of Belgium (Walloon Region) French is spoken. Brussels, the capital of Belgium, and the capital of both the Flemish and Walloon Region, originally was a Dutch-speaking city, but has been frenchified during the last few centuries. Saint Nicholas' Church and Belfry of Ghent. Discover Flanders reviews the cultural and sometimes historical highlights of Flanders. Interestingly, the most important Flemish cities of late medieval times (Bruges, Brussels, Ghent, Antwerp, Mechelen and Leuven), are still the most important cities of Flanders today. Bruges, Ghent, Antwerp and Leuven are the capitals of the province they are located in. Brussels is the capital of Belgium and of the Belgian regions. 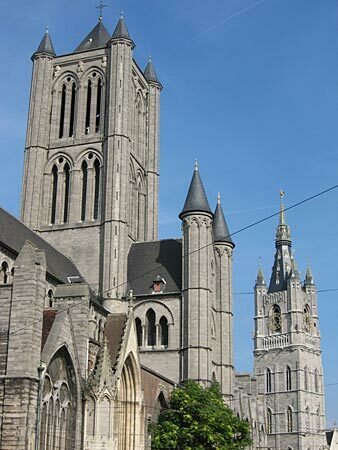 Mechelen still is a seat of the catholic archdiocese of Mechelen-Brussels. We guess that the small territory of Flanders just has no room for ghost towns to bury its ancient history. As a result, the 'old' cities of Flanders, are still living entities. The historical and main cultural sites of Flanders, are invariably located right in the centers of its cities. Traffic has been limited at certain locations, while cafes and restaurants have been added to most historical market squares, to acccommodate visiting tourists.